I never expected to be present for a reenactment of the song. 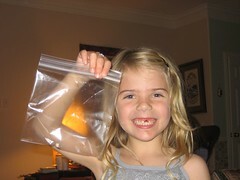 But this is my cousin Laci, who is in first grade, and practically the first thing that happened when we got to my aunt's house was that they were checking to see how loose Laci's tooth was, and it came flying out. (It landed in her mom's hair, to be specific.) And yeah, that's real blood.